Are you ready? April is the month of giveaways on this here blog! Starting today, I will add a new giveaway every Monday (Yes I know today is not Monday but let’s pretend shall we). Once the new giveaway is posted on the Monday, the previous week giveaway will still be open. ALL the giveaways will stay open until the end of the month and will end on the 29th of April. ALL giveaways will be a surprise until they are posted. Does that make sense? **UPDATE** The closing date has changed to Thursday 25 April. Read more here. Want to know what you can win this week? This set comes with 5 polishes and 1 bottle of top coat. The blue is just gorgeous and I am very inclined to keep this for myself! L.A. Girl is also a cruelty free brand so it really is a win win situation! I really like their polishes and don’t nearly use it often enough. Something I am working on fixing. The ONLY compulsory thing to enter this giveaway is to leave a comment (most likely with an answer to a question asked). You can have additional entries by tweeting or liking the facebook page. I don’t like anything where you have to like or tweet for entries so those are not – and never will be – compulsory on my blog. I can and will verify all entries before selecting a winner. If you cheat the system (I am well aware that you can), I will delete all your entries for all the prizes. Play fair! You can enter for every giveaway but you can’t win more than one. For now: These giveaways are only open to South African residents. This might change and if it does I will make sure to mention it! Use the rafflecopter widget below to enter and remember to keep a lookout for the next one! It’s all a surprise! This is not a sponsored post. These giveaway prizes were supplied by me for all the lovely people that read and share with me every day! Thank you!! Have just come back from Dischem, Willowbridge and saw these amazing sets. Love the blue! Love this giveaway! 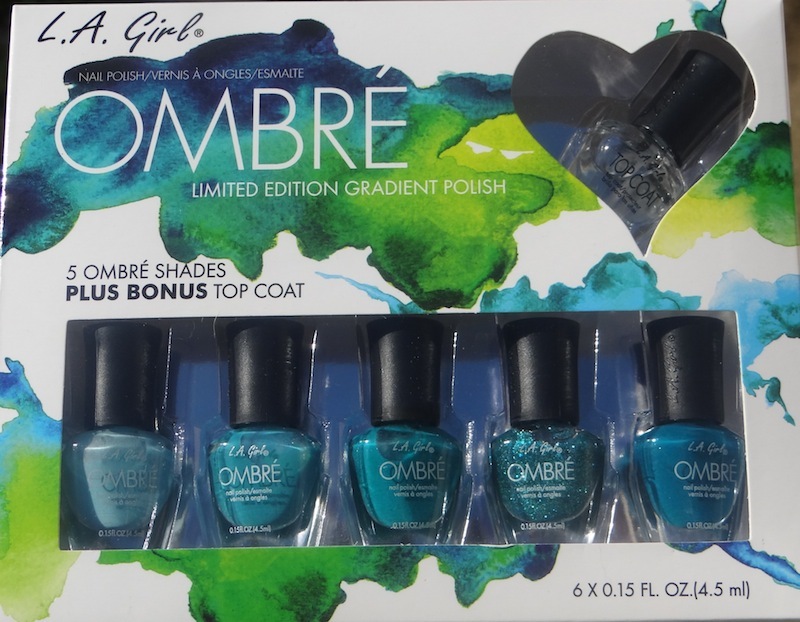 I’ve been eyeing these sets – would love to try the ombre effect, it’s been on my to-do list but haven’t yet had a complete set of polishes to try it with! I saw this set this weekend and almost took it but alas, my dry cuticles won and I got some treatment stuff instead! *sniff* I would make a mix mash of ombre and polka dots! Such awesome colours! Love this giveaway! Hi! Blue is my favourite colour, the funny thing is I have never worn it as nail polish. I wore blue eyeshadow and mascara in the 80’s!!! I didn’t catch a question to answer, but here’s my comment! Check with @acidicice just how crazy I am about blue!! So exciting, love how you’ve kept this such a surprise. I am commenting first then entering on the raffle copter – I know how horrible the widget is and how people can cheat to get more entries…can’t believe people are so mean! I would go nail art crazy and come up with all sorts of nail creations. I would also share some of the colours with my close friends:-) Oh and copy some of your awesome nail art creations! I would do a basic Ombre manicure. Ooh, what a gorgeous set! These are super cute! I’d love to do ombre polka dots 😀 Maybe ombre stripes… heck why not ombre everything? LOL, anyways thanks a bunch! never tried ombre nails. have seen von do it but too scared i stuff it up. The ombre trend is so awesome! I’d love to try it with my nails! Thanks for a fab giveaway! I’m sure my gf will love that!